After 7 years as a herd matron in the Ochsner herd in Wyoming, T124 is now a star player on the Woolfolk Farm donor team. 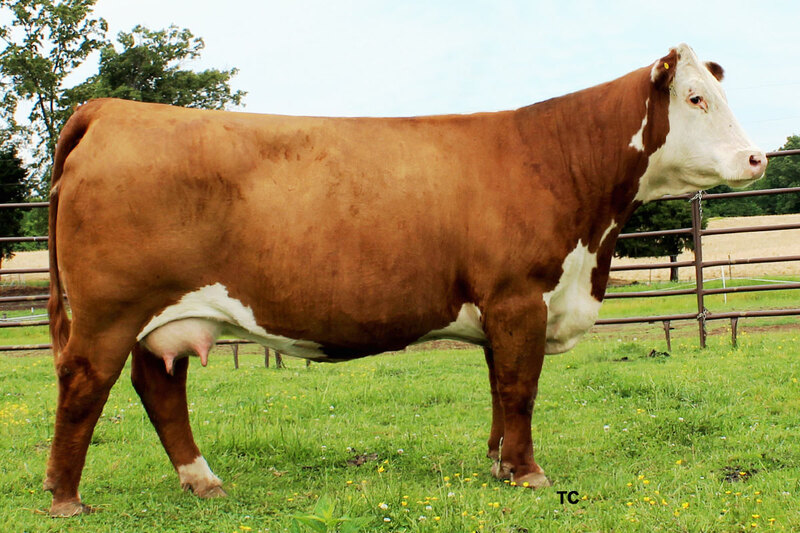 Her second calf, GO MS 7195 Advance X54 was 2012 Reserve Junior Yearling Champion at the National Western Stock Show for Ochsner, Hoffman Herefords and Boyd Beef Cattle and sold for $57,500 in the 2015 Hoffman Sale. Since arriving at WF in April 2015, she has produced successful flushes to SHF Access Y90 A216, CRR 719 Catapult 109, NJW 98S Handshake 83Y, NJW 73S Homegrown 8Y ET, GO 8019 Andy Y117, ECR L18 Extra Deep 9279. Her calves by these sires will be sale features in the 6th Annual ProfitaBull & Female Sale. Fall of 2018 calves will be from SUNDANCE KID, CL 1 DOMINO 955W, BAILEY MILES and HH ADVANCE 6248D. Owned with Hidden Acres Farm, Waverly, TN.